Hi :) Thank you very much for the comments and the e-mails about my complaining. Lots of us have written to the one seller (the one that is the most obvious) and her answer was along the lines of "I know and I don't care and so what". And that's what really got to me. We've all flagged and Etsy doesn't do anything because of all this blahblahblah I don't feel like getting into right now (because then this will turn into another complaining post, and we should just get to the nice part). 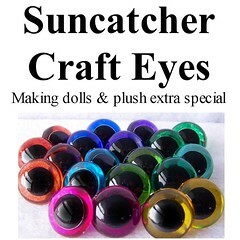 Work on face - Position and attach 6 mm plastic eyes with safety backings, embroider mouth. Sl st, bind off, leaving long tail for sewing. Sl st, bind off, weave in loose end. Don't forget to write if you have questions & to let me know how it comes out! i'd just like to say, you are an inspiration. although i haven't finished crocheting an amigurumi because school is always in the way and my cat always finds a way to get into the yarn draw. thanks for posting these cute patterns. everytime i want to give up, i come back and look at your patterns and it fuels me to start again. i can't wait until after exams, seriously. my goal is to complete one! hahaha xD and i will definitely purchase your book! Love the cactus! My parents have a house in Utah and I think the little cactus will fit right in. I'm going to send the pattern my mom's way since I cant crochet for anything, lol! Thanks for posting it! I recently started to crochet and thought I would try my hand at amigurumi but don't know how to proceed when reading the pattern instructions for the first round. The patterns would go for example, 'R1- Ch 2, then 6 sc in the second chain from hook'. Does this mean I keep single stitching from the same spot (second chain) 6 times? I really am a total newb at this, so I was wondering if you could help me better visualise what I should be doing. I am new to crochet. All you need to do it google BPsc crochet abbreviation and up comes plenty of websites to help you, even with video. The back post single crochet is very easy to do. Saying that: I need help on how to sew the cactus into the planter. I am thinking it would be better to use the tail from the planter instead of the tail from the cactus. Thank you for the cute patterns. Lyn, you keep single crocheting in the second chain from the hook 6 times then go on to R2. I just started to crochet and I made my first amigurumi last week and have made more since. Start with a simple pattern.....maybe a mouse. Your patterns are the cutest! 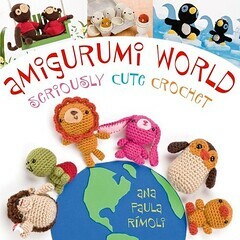 I can't wait to try out this adorable pattern! Thanks! Hi, your patterns are super, thank you. I wait for the book now annnd i have 2 questions, what kind of yarn do you use? and what for a hook? ?, here i bought a yarn 50 cotton 50 polyester and a 2,5mm hook is that ok????? I just got done making this, but the cactus doesn't fit in the pot :( very sad. I'll try again and change the pattern a bit to see if that helps. Super cute though!!! This matches my tattoo wonderfully! I can't wait to make this for my dorm room. Thanks for posting the pattern. Made me learn a new stitch! Which is great!!! Although I think I did that backpost sc a frontpost sc, LOL, so I turned my pot inside out, which looks alright. Thanks again for the pattern!! I love your cactus; I've seen that several people have enjoyed your pattern and posted photos of their own on Flickr. Very cute! I also want to share my cactus pattern with the world and I hope you might like to have a go at it too! 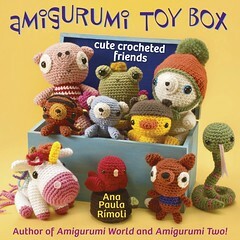 i am very excited about your new book-- i have your first book and used the animals (bear, elephant, lion, monkey) to make a mobile for my niece! it is beautiful! i just purchased your new book in advance from the amazon sight-- i was wondering when it was expected to start being shipped? 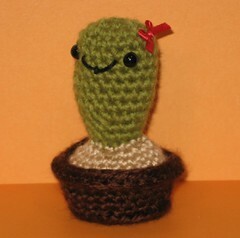 I've recently started doing dolls and bears and that stuff, and I want to do this little cactus..but, you know Spanish right? Could you please sent me or post me the part of the planter in spanish? hi, i am doing my cactus but don´t really knwo how to do the "front loop only" thing. i have been looking on the internet but still don´t know. Also, what is the name of that stich in spanish? thank you. 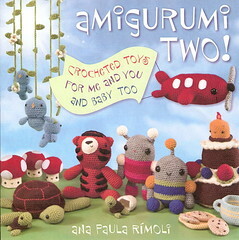 your amigurumis are so nice! I really like this pattern! I am making a website with free crochetpatterns translated into Dutch. So is it allright if I translate this pattern and put it on my website? I will mention your name & website too of course. I made this little cactus, and it's really adorable! The cactus part was very easy (I'm still fairly new to crochet and amigurumi), but I did have some issues with the planter. I think I got the BPsc's right, but for some reason it got twisted, and then I didn;t know how to add round 10. So I stopped there, and sort of bent it in the shape I wanted, and I have to say it actually looks kinda good. I crocheted a little bow, and voile, she's done! i cant crochet anything but a scarf to save my life! can I buy one of these lovlies from you?? she makes my heart smile!! 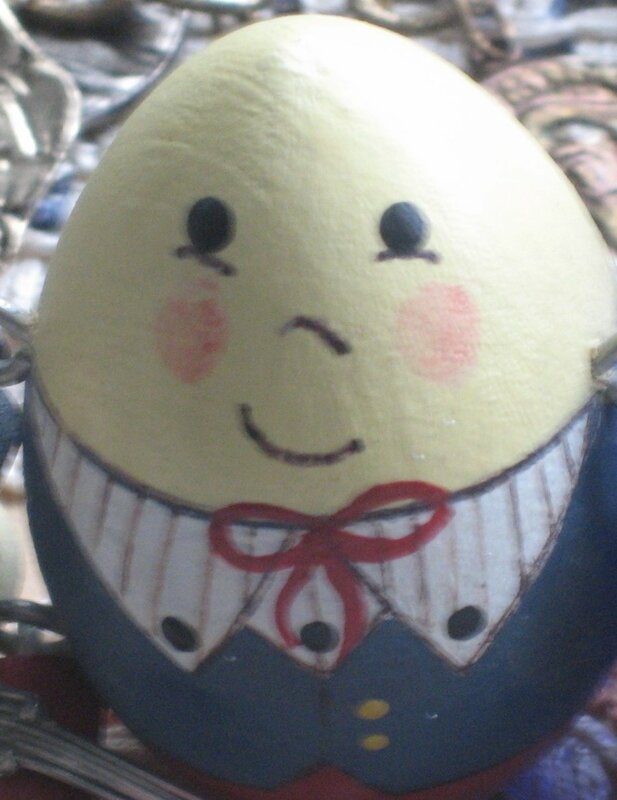 !or if you dont sell them, any idea whoe/where I can purchase one from??? love your site! 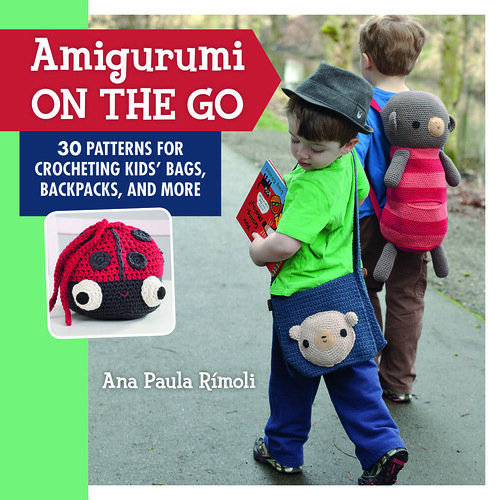 Ana Paula, I absolutely love your patterns. Thanks for the cactus. If I could figure out how to post pictures of how mine turned out I would. Thank you so much for your free patterns! Que arte tienes!!! Todos estan bellos!! Quisiera saber si este patron lo puedo conseguir en espanol!!! Gracias!!!! Really a cute pattern. Thank you so much for sharing. Love your patterns. LOVE! Know someone this would be perfect for, thanks for sharing! CAN'T WAIT TO START THIS PATTERN. I MAKE A LOT OF SCARFS AND SLIPPERS AND SELL THEM. LOVE TO CROCHET AND KNIT. Thank you so much for this adorable pattern! My daughter loves cactus and is building up quite a collection...but she won't be able to find this one anywhere!! I think this will make a great Christmas gift for her! This is just adorable!! Thank you so much for the pattern. I want to make one for my Mom for mother's day! Just love it! Adorable! I made three this week! They varied in the end from yours, but I love them! Thanks for sharing! This is absolutely wonderful. It makes us laugh just to look at it! Thanks so very much for sharing. A knit version of this would be divine!!! Starting at Round 4: you wrote Sc 18, does that mean sc for that whole round and you end with 18sts or actually sc 18 in each till the end of the round.